Recipe by: Try This Recipe! "I love a good slice of cake and a cup of tea, particularly when it's warm and sunny outside. And nothing says sunshine like bright yellow, zesty lemons! 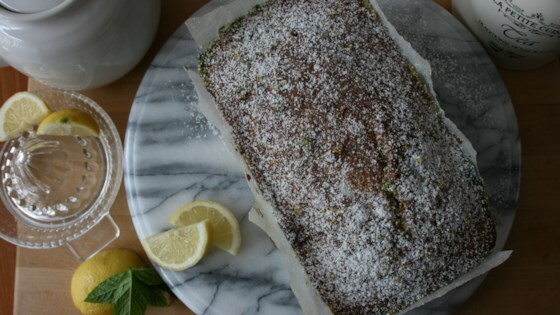 This is one of my favorite, easy recipes for a light, fluffy lemon drizzle cake. This is also my boyfriend's absolute favorite; he exclaimed it was the best cake he's ever had, which is certainly saying something! Serve with a cup of tea and a scoop of vanilla ice cream. When life give you lemons, make lemon cake!" Preheat the oven to 350 degrees F (175 degrees C). Measure ingredients into bowls. Line a loaf pan with parchment paper. Combine 1 cup plus 2 tablespoons sugar and butter in a large bowl. Beat with an electric mixer until creamy and pale. Add 1 egg at a time, beating until the batter returns to a uniform pale color before adding the next. Sift in flour gradually. Fold with a wooden spoon to be sure flour is combined. Add baking powder and lemon zest. Pour batter into the prepared pan, being careful not to press it down. Bake in the preheated oven until a toothpick inserted into the center comes out clean, 40 to 45 minutes. Try not to open the oven door early to avoid collapsing the fluffy cake. Juice the zested lemon into a small bowl. Add the zest and juice of the second lemon. Stir in 7 tablespoons sugar until dissolved. Pour glaze over the warm cake and leave to cool in the pan; glaze will harden as the cake cools. See how to make a vanilla cupcake with a secret surprise inside. I like to add very finely chopped mint leaves to the glaze for a refreshing twist! I left in the oven for 55 minutes as it did not appear to be done after 45. Cake was very dense, quite moist. Super lemon flavor but just a tad to sweet for our taste.